The timeless tranqulity of Colston Farm, nestling between the banks of the River Dart and the folding hills of South Devon reflects farming life as it has been for four generations of Wakehams. 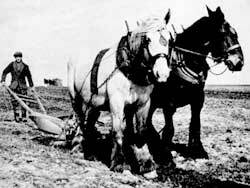 When Great Grandfather farmed here there were no tractors - horses did all the work. They delivered the milk to Buckfastleigh that he had milked by hand early in the day in the little shippon. They took stone up the road to rebuild Buckfast Abbey. They harrowed and worked the fields and cut the hay. Apples were picked by hand - as they still are today - in the seven acres of old orchards and made into 'Colston Cider' in the pounds house. The locals who helped at the weekend were paid in cider annd potatoes. Now the apples go a few hundred yards down the road to make organic apple juice. Traditional farming, where the animals' comfort is paramount, has been lost to industrial farming in so much of the country, but not here at Colston. Primarily a beef and sheep farm, Helen's sows arrived here about seven years ago. Only two initially - and gradually since then demand has increased it to seven. Local people have been eagerly buying the meat and now customers at the local Farmer's Markets and holiday makers who "Can't find anything like it at home"are persuading us to spread the word. Proper pork is now available by free local delivery or by courier nationwide, it can also be collected from the farm by arrangement. 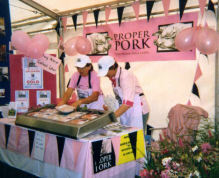 Proper pork can also be found at Tuckers in the Ashburton Local Produce Market. We always bring along a large range of meats for our customers to sample. Fashions and technical changes have effected other farms while life at Colston has gone steadily on practicing the same traditions as always. We are a contented people caring for contented animals. The way of life here at Colston is reflected in the quality of the end product - irresistible pork - the likes of which are gradually becoming a thing of the past around much of the country.